Download ESXi 5.5 Update 1 and the other vSphere Update 1a pieces to get your home lab started. ESXi 5.5.0 Update 1 Driver Rollup 2 ISO with updated drivers (Includes VMware Tools). Boot your server with this ESXi Driver Rollup image in order to install ESXi with updated drivers. ESXi requires 64-bit capable servers. This image should not be used for ESXi upgrades. NOTE: After installation of the ESXi Driver Rollup ISO, VMware strongly recommends applying the ESXi 5.5.0 patches related to Heartbleed, a serious vulnerability in OpenSSL version 1.0.1a-f. See KB2076121 and KB2076589 for details. that includes drivers for various products produced by VMware partners. 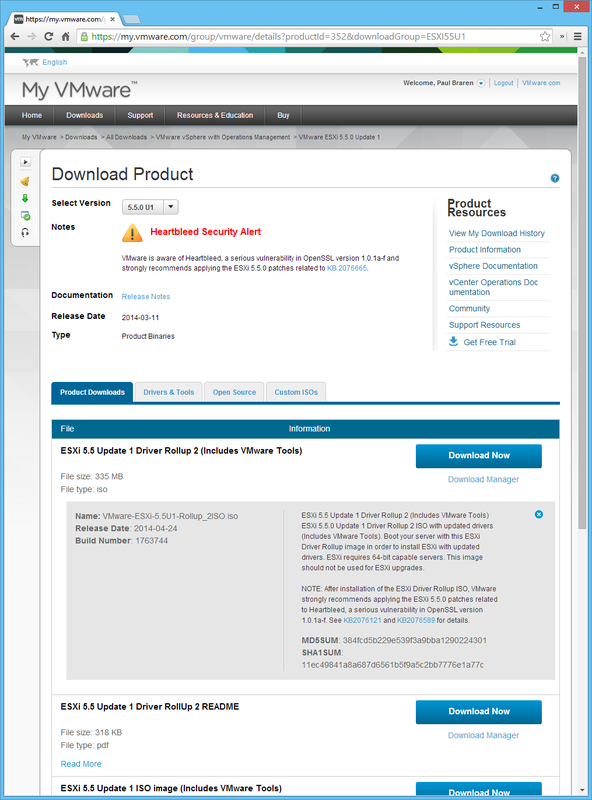 recommends applying the ESXi 5.5.0 patches related to KB 2076121 and KB 2076589. This is intended to be used clean installations only. In other words, it won't do upgrades. 3) What does it do for you? This is not the first time that an ESXi Driver Rollup ISO causes issues (see my earlier warning about the ESXi 5.0 Rollup ISOs), and to me it is not really clear why VMware publishes these ISOs and what their intended use case is. but not likely, since it's not really a "real" update, it's just a driver update, and I haven't located any documented claims this fixes this iSCSI issue (that I haven't been affected by). Nor does it really fix Heartbleed. Notice this Heartbleed patch method by Andreas Peetz that I demonstrated on video at this spot, where my 5.5 build's drivers sure seem to be updated. So, what's your experience with this new ISO? Drop your comments below, no login required.